Welcome to our first blog entry, which I will try to post an interesting story, experience, or cake secret that happens at San-Pietro bi-weekly! 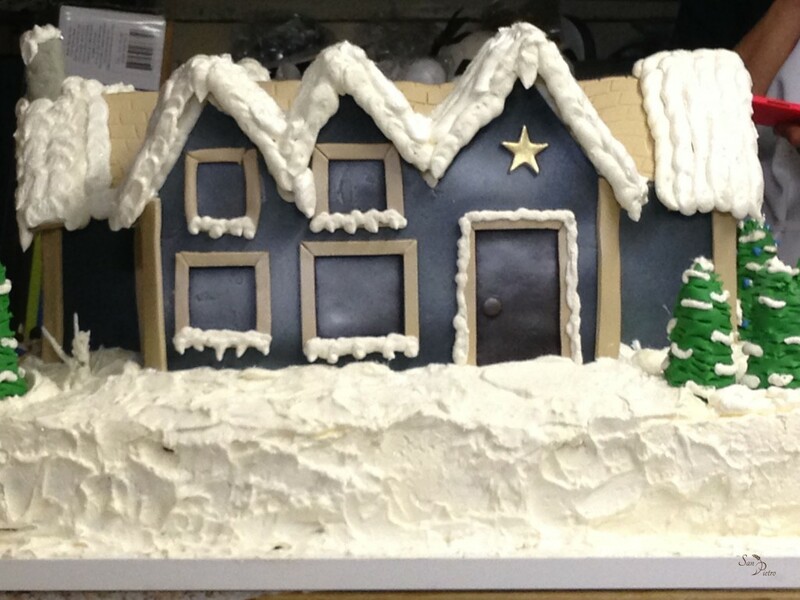 I hope everyone had a great Christmas, this year for Christmas we had a challenging fondant house cake to make. 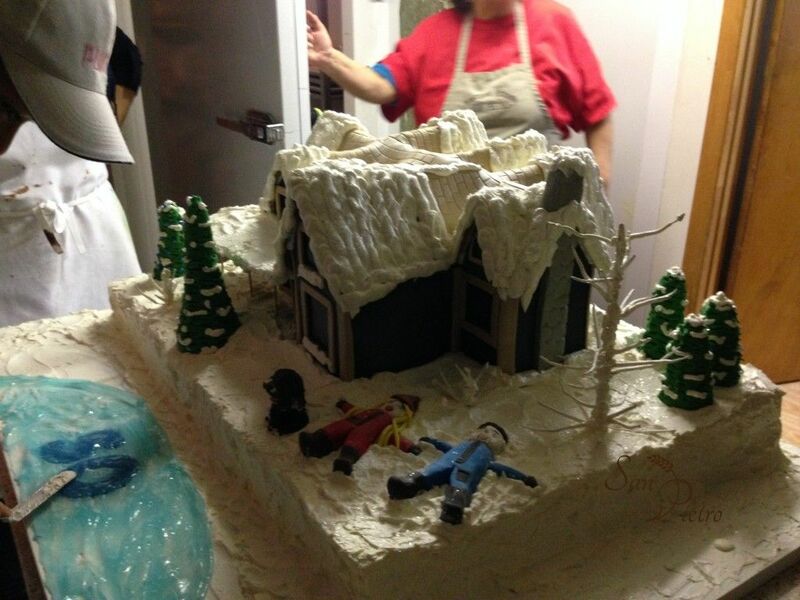 The cake was huge, 30″ x 48″, that’s 2 and a half feet by 4 feet wide! 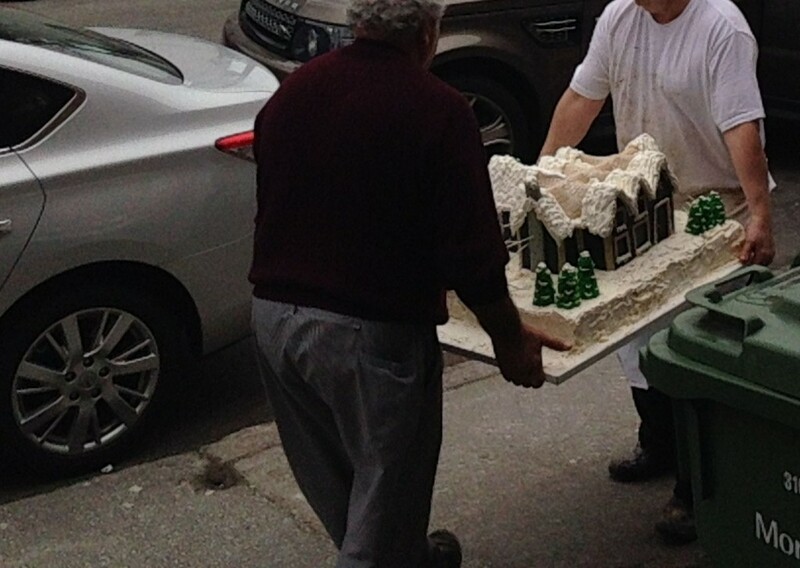 The first advice I’d like to tell anyone that is going to attempt making such a large cake, is…when making such a large cake, always make sure it will pass through your door(s) and into your fridge! And lets kick it off, this was the front of the house, this house was is an exact model of some real home somewhere in Mont. Tremblant, QC. In the back of the home I put our two stars, and their dog, playing in the snow making snow-angels. There’s something about creating snow angels that is peaceful, and that is how I envisioned the owners of this home. 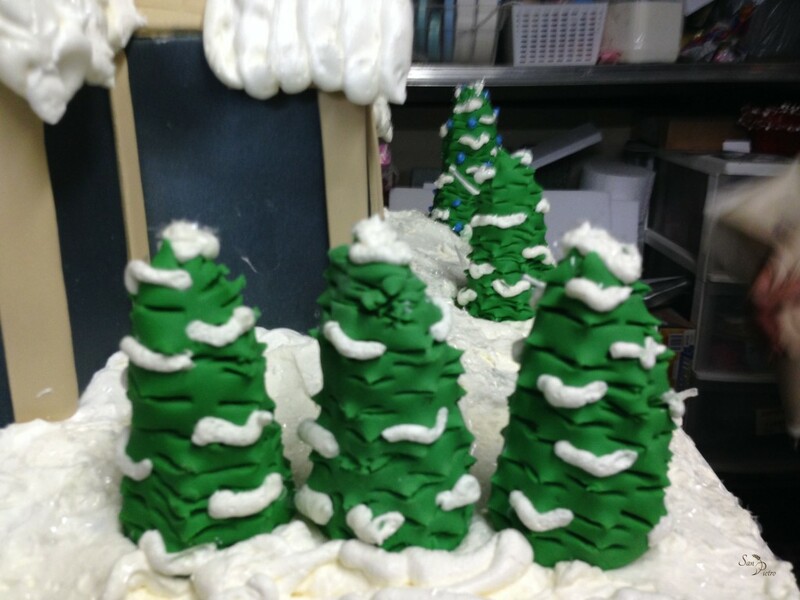 Here we have a close up of the winter evergreens, which have a representation of snow on their branches. Do they look realistic? Hear we are finalizing it, and getting ready to store it in our walk-in fridge. You would have guessed correct, if you thought we worked close by to the fridge. We had the men (thank god for them) put this heavy cake onto a wheeled table, and there it remained, while we worked on it. It was convenient to just roll it into the walk-in, and back out. 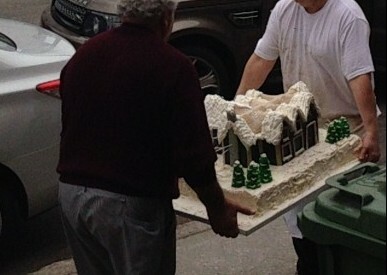 A cake this size, needs time to freeze and take its shape, you cannot decorate it in one sitting. You need to do it in phases, otherwise the cake will thaw, and then it won’t hold its shape. 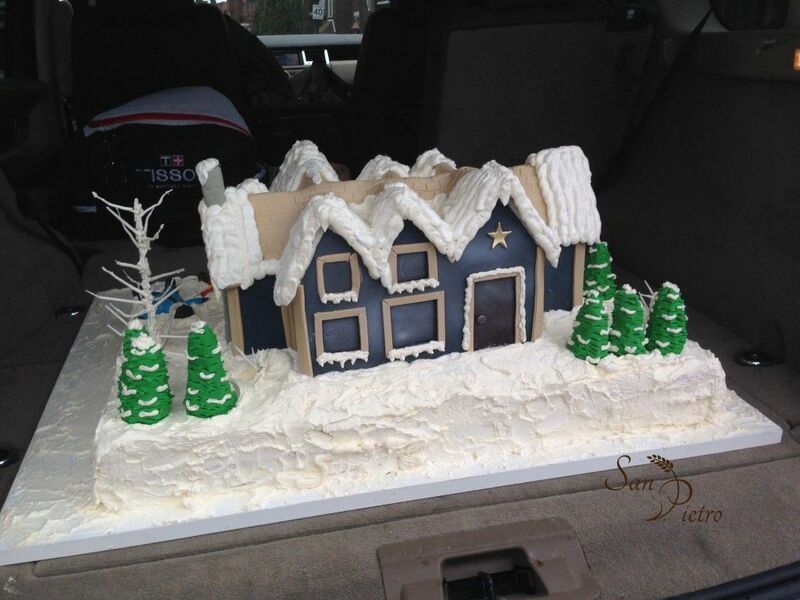 This year, we had a warm Christmas, in Montreal, global warming perhaps, sadly, as you see, it wasn’t a white Christmas as we brought the cake to the customers vehicle. This cake was way too heavy for us girls to carry, thankfully, our boys did all the heavy lifting! Off to be eaten! When you think of it, its really sad to see it go. 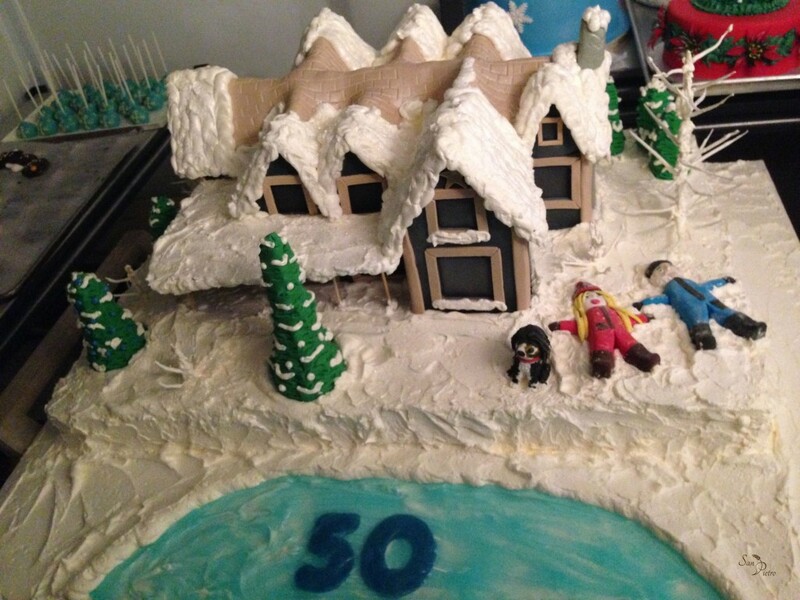 The number of hours it took to put that house together, with only edible arrangements, and to see its final product is a sad, and yet a happy moment. In a few hours after it’s displayed, it will be hacked up into little pieces, and its existence will only be a figment of our imagination.